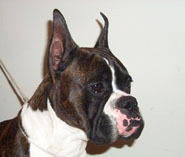 Zaracon Boxers, reg'd is pleased to introduce our litter between Sawyer and Blackjack. Both are health tested for: hips, thyroid, and heart (sub-aortic stenosis and cardiomyopathy). Sawyer has also had her eyes tested and Blackjack has been Von Willebrands tested. Sawyer is a multiple group winner in Canada in limited showing and is the dam of nine Canadian champions (with two others pointed). This is her third and final litter. 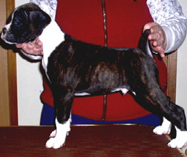 Sawyer is the restart of our breeding program at Zaracon; she was bred by Mary Curl of Shadowdale Boxers. Blackjack is an American / Canadian champion, a multiple breed and group winner in Canada, and a Best in Specialty winner in the states. He has numerous Canadian and American champions to his credit. 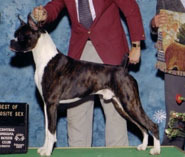 Blackjack was bred by Josie O'Reilly of Summer Boxers in Alberta, and he is owned and loved by Lee and Mary Jane Nowak of Shadigee Boxers in Kentucky. Both Sawyer and Blackjack have been awarded a Best Puppy in Show in Canada. 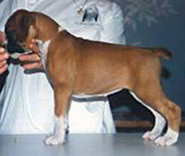 This litter between Sawyer and Blackjack will be ABC Futurity nominated for 2007. It was born on the evening of 31 August 2006 and the morning of 01 September 2006. There are 10 beautiful babies: one white girl with two brindle patches on her head, one flashy brindle girl, two plain brindle girls, one white boy with a dark eyebrow, and five flashy brindle boys.